My stunning half Nelore and half British White heifer, HBW Daisy, calved yesterday evening a pretty little heifer!! Daisy has proven to be very easy-keeping. She grew that magnificent frame while on the same hay and alfalfa as the BW heifer herds she has run with since I brought her home. Daisy has shown clear tolerance, or perhaps lack of desirability to biting flies and lice, excellent heat tolerance. Basically, this gal never misses a beat. My goal . . . a gentler version of my beautiful Miss Daisy. Tomorrow I'll be dashing out to get a birth weight on her new heifer calf, and will cross my fingers I can get a tag in her ear before Daisy pounds the earth to get to me!!! While she's let me touch her, comes readily to me offering alfalfa, she clearly has extreme protective maternal instincts and does not trust me as my BW girls do. Her heifer calf was very laid back about me having a look at her, popping up her tail to confirm she was a heifer. She didn't startle at all, I was thankful for that as we were close to the state highway fence. 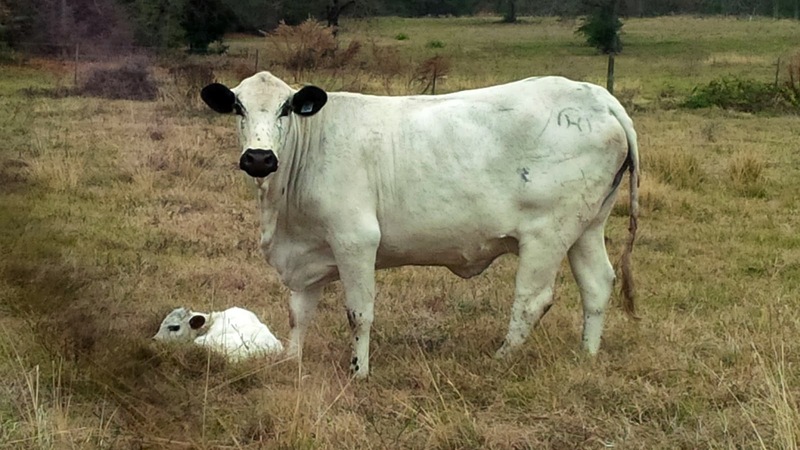 That said, I wasn't going to pop her up on her feet and take a chest measure so close to the highway; if she dashed thru the old highway fence I've no doubt Miss Daisy would have simply taken down all the barbed wire and headed after her newborn heifer on US Highway 69. . . .
American British White Females in Texas Available for Lease for Embryo Flushing . . . 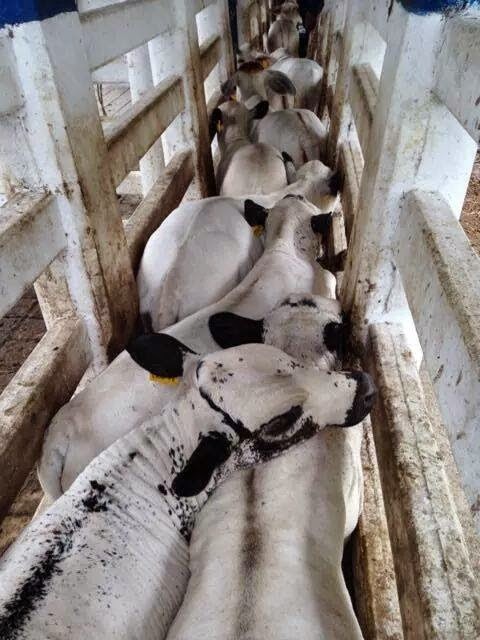 The topic of embryo flushing has come in to conversation this past week, and I thought of this fine photo of Colombian BON calves the product of embryo transfer. If you are interested in embryos of the British White breed, or using one of my females for flushing to the BON or another breed, please let me know. I will certainly make available my superior females for flushing and export on a lease basis as I've done in the past. It's an excellent approach to introducing desirable genetics around the world. 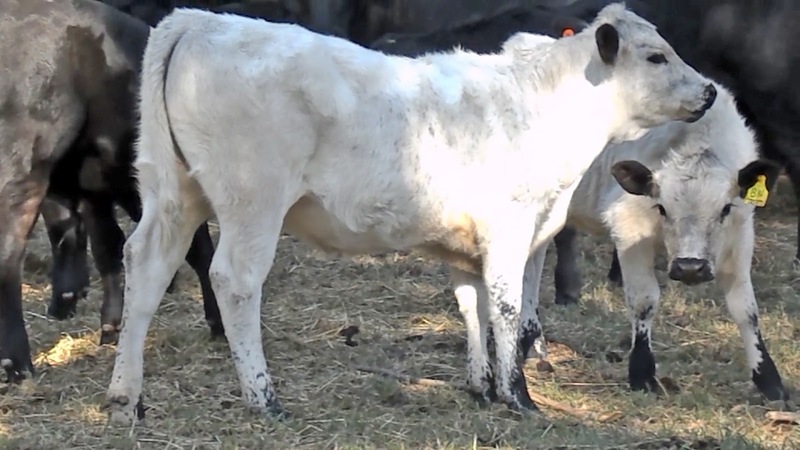 I think the combination of the beefiness of the American British White and the BON's documented excellent tolerance to heat and biting insects would be a great joining for tropical areas in pursuit of greater beef production in tropical environments. One day it will happen!!! Excerpts below are from the 1896 publication "A Man's Value to Society", preface to Chapter 8 "The Enthusiasm of Friendship". "Disobedience is slavery. Obedience is liberty. . . . disobedience to the law of morals gives waste and want and wretchedness. That individual or nation is hastening toward poverty that does not love the right and hate the wrong. So certain is the penalty of wrongdoing that sins seems infinitely stupid. Every transgression is is like an iron plate thrown into the air: gravity will pull it back upon the wrongdoer's head to wound him." Let their be peace . . . and faith in our civil system, for each of us. Obama says: "Understandable reaction?" Hardly. 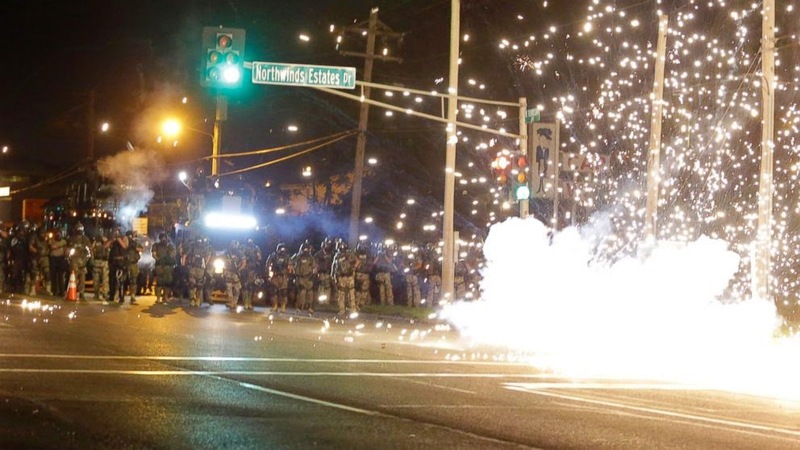 Gun shots, rocks and bottles thrown, police cars attacked, fires and .... whatever else. Absurd. Shameful. Hardly Understandable. Burden falls on the baiters and the mainstream media and the rabid liberals who regularly lay waste to the the old Christian laws of morals that has lead to waste and want and wretchedness" . . . among some other rather significant others of influence. Fussy newborns! They are a bit indignant and confused as their dams abandoned them for fresh hay. It went from a peaceful easy morning of measuring and tagging them all (don't think I've ever tagged that many at once) to chaos as soon as Mike put out the first bale. An excellent article from the Lampasas Dispatch Record examining the cost and value of raising your own replacement heifers vs buying them in today's market environment. When it comes to replacement heifers in beef cattle operations, producers are faced with a dilemma: Raise them, buy them or sell them and “take the money and run,” said a Texas A&M AgriLife Extension Service economist. It’s becoming an all too familiar situation among Texas ranchers, said Stan Bevers, an AgriLife Extension economist at Vernon who recently presented a study at the Texas A&M Beef Cattle Short Course. “We looked at what the market is right now for replacement heifers,” he said. 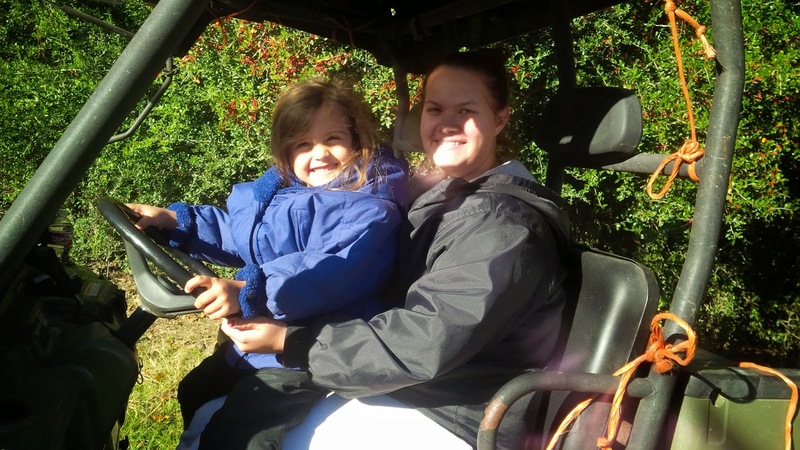 “We were targeting heavy bred heifers, and they were anywhere from $1,650 to $2,300 a head. The second number was what it was costing the rancher to raise them themselves. Bevers said since this ranch was located in Oklahoma, one would need to add $300-$400 a head to that for Texasranchers and regional market prices to develop replacement heifers. 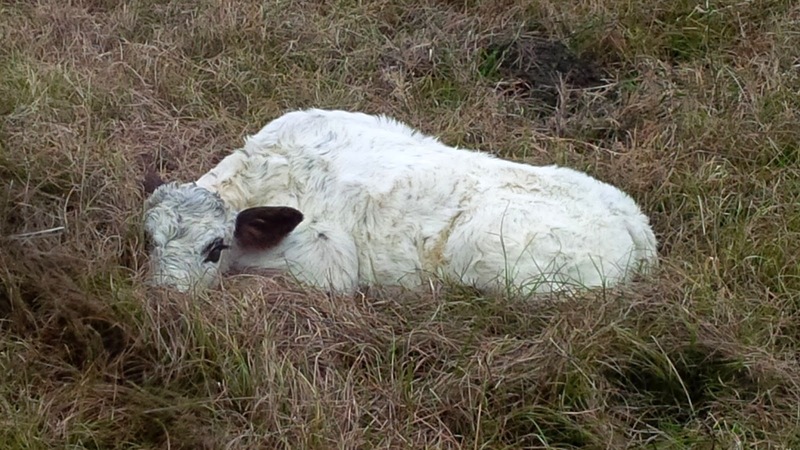 “That comes out to $1,400 to $1,800 to develop replacement heifers in Texas,” Bevers said. Bevers said that leaves three numbers to consider. “We know the market is $1,650 to $2,300, and it takes $1,400 to $1,500 to raise her, and now she is worth $2,300 in my herd economically. Bevers threw in a fourth number – what feedlots are paying for commercial heifers destined for the beef market. Right now, it’s about $1.93 to $2.03 a pound, he said. I spent some time the past few days watching online auctions of registered cattle, reading through the trade magazines for the results of commercial sales as well as registered, as I'm getting ready to put a group of females and some bulls up for sale. 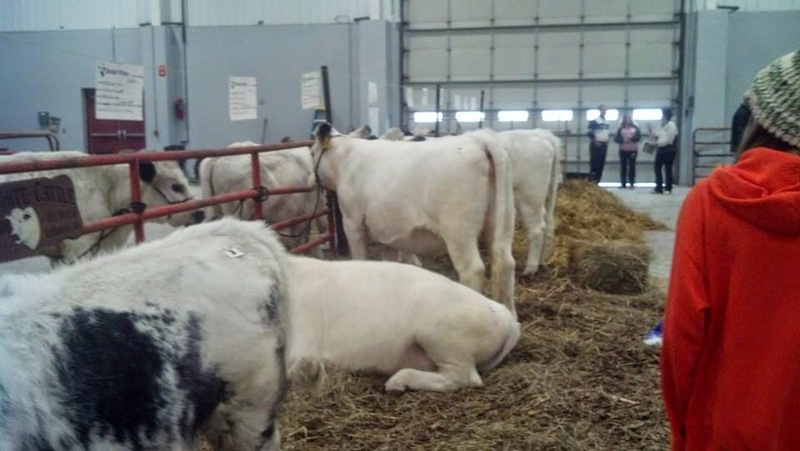 So, I much appreciated Kim Hilty's reporting of sales results at the latest British White auction in MN a few days ago. As with most items, live bovines, or goods, the price ultimately reflects the quality of the product, the visual, and of course the demand, and not to be discounted is the sales platform, whether it be the individual or an auction -- presentation and attitude and information are paramount. You can see in the sales results the buyer's desire for bred heifers or cows vs open ones. I would also say the prices for Fall bred cows are disappointing, perhaps more would have been realized at a sale barn, but as Kim says here, you have to remember that those that were Clean, Good Quality, and halter broke (not my thing, I prefer tail breaking ) brought the highest dollar and it is just the 2nd annual auction, so the buyers could pick and choose - not so different from a Lowline sale I watched this weekend online. Had there been more buyers, I've no doubt the results would have been greater at that Lowline sale in Athens, Texas. That said, Kim's reporting of fall bred cows, coupled with what the 8 young bull calves sold for, some of which were weaned upon sale -- not so bad at all. Combine the top fall bred cow with the top bull calf, you've got $3300 in value for the pair, combine the bottom fall bred cow at $1300 with the bottom bull calf at $900 for $2200, again not bad, presumably it was quality and conformation that made the difference. Compare these results with the Bohaty sale this last spring, where the base price was I think $2500 for bred heifers But then the Bohaty's have spent years supporting their buyers after the sale, provide 100% of the information a buyer needs to make a decision. . . Visit them on Facebook here:https://www.facebook.com/BohatysBritishWhites . 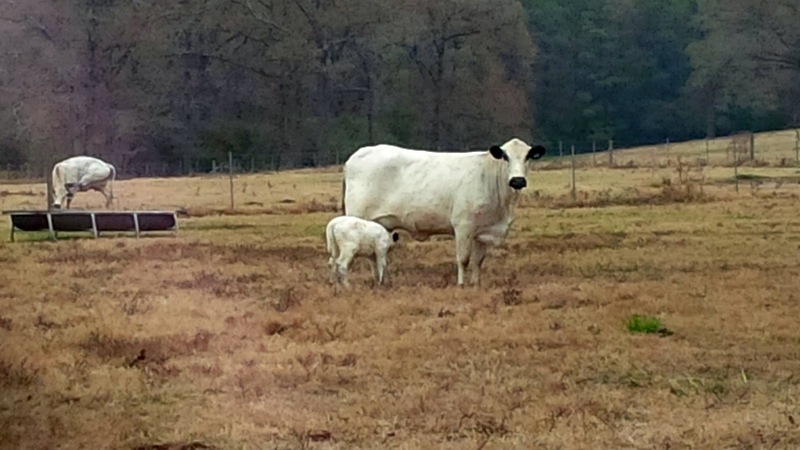 See www.whitecattle.org for additional information on the ABWPA that has for many many years provided registry and primary focus on the British White bovine, and gives their full support to the new Minnesota British White Cattle organization. My apologies for being out of pocket for some months now. Here's a look at my British White cattle early morning a few days back in a heavy fog, rather peaceful I think. I hope you enjoy it as well. . . . This Texas gal went down under to the beautiful southern state of Victoria in Australia. Besides the utterly beautiful scenery, excellent coffee available every where one looked, bird life that was captivating, and so much more . . . I also saw some very grand British White cows! 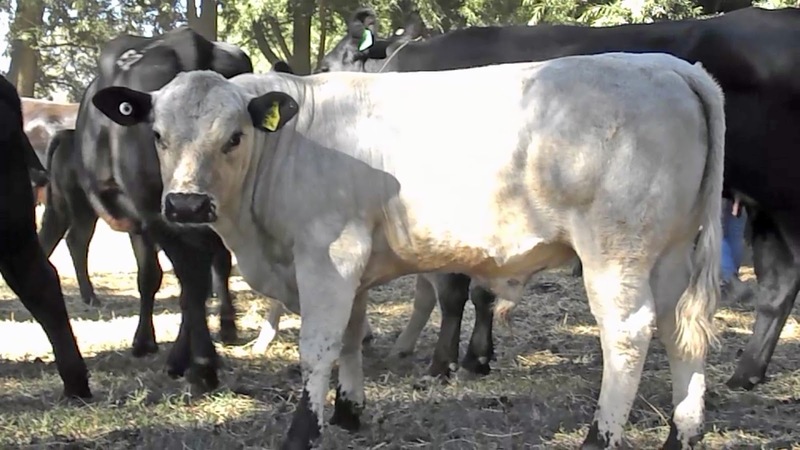 It was the occasion of Australia's annual Beef Week, and for the first time ever the British White breed was showcased on beautiful Shrublands Estate which is primarily a Black Angus stud, but with a keen interest in developing a top herd of British White cattle. 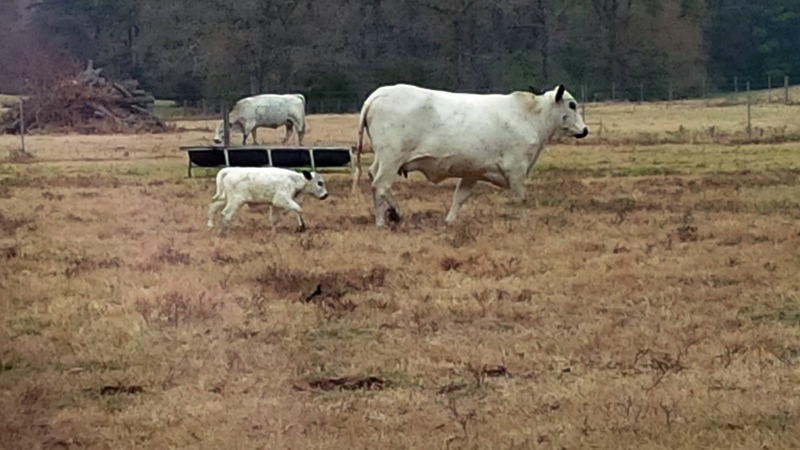 Shrublands had a couple dozen British White calves on the ground for visitors to delight in. Much of the folk dropping by were there for the unusual opportunity to learn more about the British White, as for most, it was their first introduction to the breed. 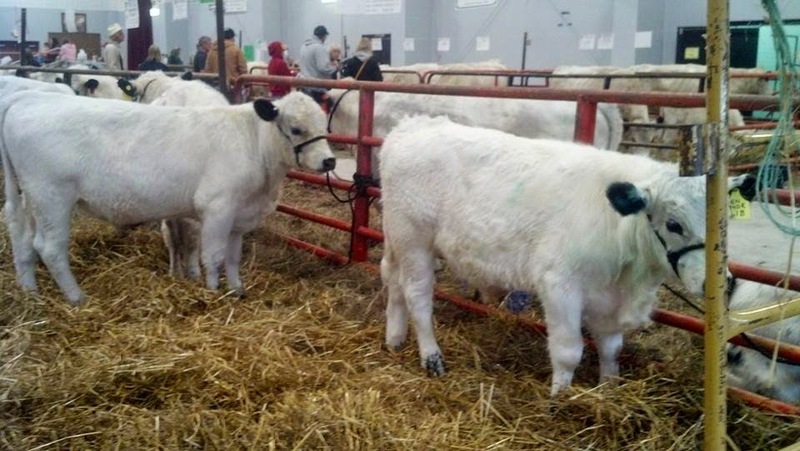 The British White calves are all the product of Embryo Transfer and the embryos were collected from several females from the herd of J.West Cattle Company, and variously sired by J.West's Elvis and J.West's El Presidente. Shrublands has a particularly promising young 5 month old bull calf sired by J.West's Elvis that draws everyone's eye and leaves one saying "Wow!" Shrublands Estate is located alongside the beautiful Goulburn River in Thornton, Victoria. 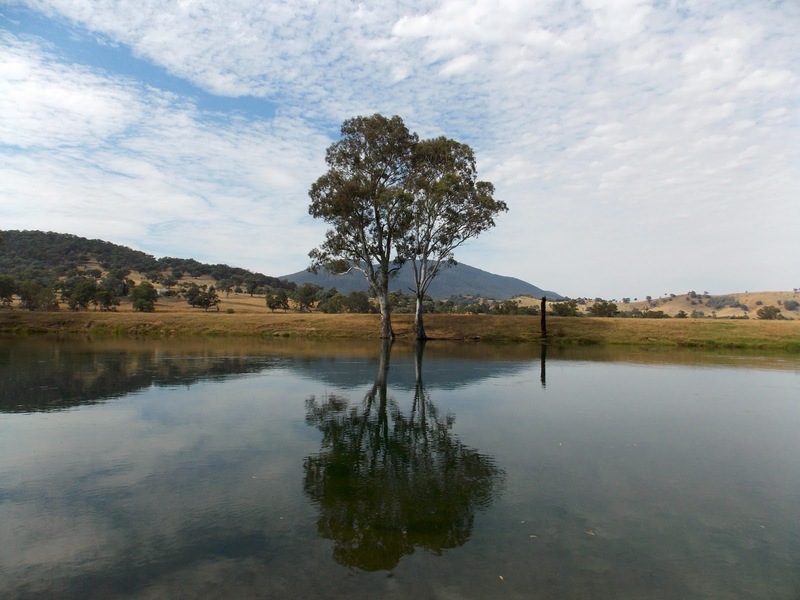 Being located in close proximity to Lake Eildon upstream, the Goulburn waters are incredibly pristine and icy cold. The Eildon Wier (dam) releases waters from the vastly deep man-made Lake Eildon this time of year, Australia's summer, for use in agricultural croplands that rely on the waters of the Goulburn for irrigation. The Goulburn is fully at its banks this time of year, but in the winter the water level of the Goulburn can be so low in this same area that cattle oftentimes stroll across to adjoining pastures on the other side for a visit! This slideshow of my visit is a nice overall look at the Shrublands Estate in Thornton, Victoria.